UPDATED: Mon., Aug. 28, 2017, 3:39 p.m. 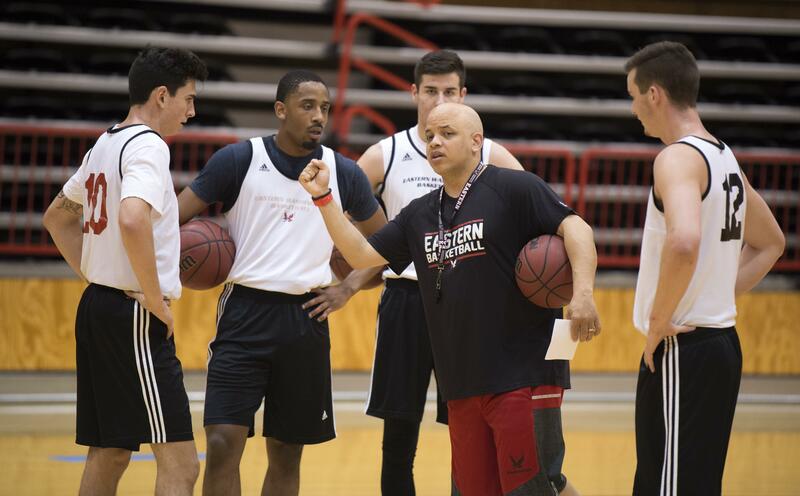 The Eastern Washington basketball team will earn most of its nonconference wins the hard way this season – on the road. And it’s not easy path for the Eagles, who will play three teams from the Pac-12 Conference and two from the Mountain West in one of the most challenging nonconference schedules in years. The schedule, released Monday, includes just three games at Reese Court before Big Sky Conference play begins on Dec. 29. The Eagles enjoyed six nonconference home games last season. “We are really excited about our non-conference schedule,” said first-year coach Shantay Legans, whose opening game is at home on Nov. 10 against Walla Walla. Then it’s 10 straight on the road, beginning with Washington and Stanford on Nov. 12 and Nov. 14, respectively, before three games in Las Vegas. Eastern, 22-12 last year, will play at UNLV on Nov. 17, then take on Georgia State on Nov. 20 in the MGM Resorts Grand Main Event at T-Mobile Arena. The Eagles will play either Prairie A&M or Eastern Kentucky on Nov. 22 in the championship or consolation game in the tournament’s “Middleweight” bracket. Eastern plays its third Pac-12 opponent in the month when the Eagles travel to Utah on Nov. 24, then take on former Eastern head coach Jim Hayford and Seattle on Dec. 3. Eastern’s road stretch closes with difficult road games versus fellow 20-victory teams San Francisco on Dec. 7, South Dakota on Dec. 10 and Wyoming on Dec. 12. Eastern will host Cal State Northridge on Dec. 17 and University of Providence on Dec. 20 prior to opening Big Sky Conference play. Eastern opens its league home schedule on Jan. 4 versus Portland State and Jan. 6 against Sacramento State. Eastern hosts Idaho on Jan. 12 in a doubleheader with EWU’s women’s team. Other home games on EWU’s schedule include Jan. 25 against North Dakota, Jan. 27 versus Northern Colorado, Feb. 15 against Montana, Feb. 17 against Montana State, March 1 against Southern Utah and March 3 versus Northern Arizona. The Big Sky Conference Tournament is scheduled to be played at the Reno Events Center for the third-straight season. Action gets under way with the first round on March 6, followed by the quarterfinals on March 8, semifinals on March 9 and the championship on March 10. Published: Aug. 28, 2017, 3:08 p.m. Updated: Aug. 28, 2017, 3:39 p.m.